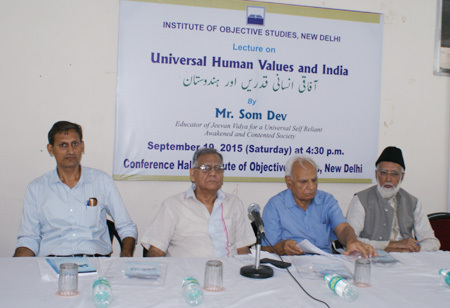 The Institute of Objective Studies organised a lecture on the “Universal Human Values and India” on September 19, 2015 at the conference hall of the Institute. 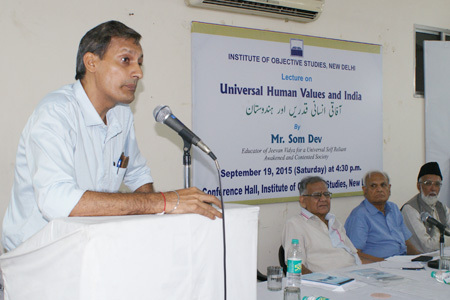 Delivering the lecture, Educator of Jeevan Vidya, for a Universal, Self Reliant, Awakened and Contented Society, Mr. Som Dev, said that today’s confrontation was centered on search for self or individual identity. He stated that the entire purpose for existence rested on the twin fundamental questions of the purpose of life and the way to lead it. In our thought process, man was missing, because the way we received education, the manual which would have guided us, was missing. Elaborating upon his point, he said that we did get education, but that was worthless as the manual was missing. He observed that whatever man did, thought and spoke, was done in search of pleasure. Every human being in the world had the motivation of pleasure. Pleasure was, in fact, the willing acceptance of something. While noting that the ways to attain pleasure differed from man to man, he said that the denial of something was tantamount to unwillingness or rejection of pleasure. One’s pleasure might be rejected by someone else as unhappiness. 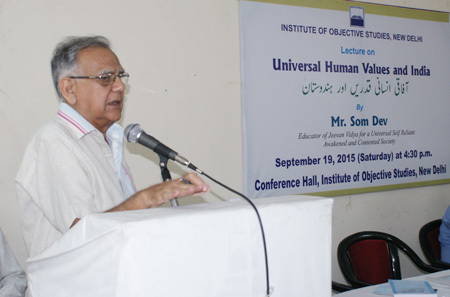 Mr. Som Dev contended that the entire cosmos was Gods’ creation. Being in perfect harmony, it was called the nature’s system which was in continuum. Blaming modern education for all the ills today, he said that since man was the creation of nature, his needs were unlimited but the means were limited. He explained that there was complete disharmony between body and the mind. The body was demanding while feelings were impulsive which did not demand material things in such a way. Thus there was need for complete communion of body and mind to be an objective human being. We were led to believe that with the increase of means, relations with our family would improve, but that was not to be. He observed that we lived under one roof and wanted to live life, but were not living the life. Human being was the only unit in the universe which had a sense of perception. He needed education to understand society. Lack of understanding was the genesis of social tensions. If a family succeeded in living together, the whole world could live together. Mr. Som Dev buttressed his point, by saying that society broke with the introduction of election as the funds started flowing, leading to corruption. This also resulted in the size of society narrowing and the size of politics expanding. He remarked that we were influenced by status without auditing the delivery. Sharing his experiences as an electronics professional, he said that bribery and corruption were rampant in the system. No work could be done without greasing the palms of those who mattered. He said that he went deep into the malaise while visiting remote villages of Bastar in Chhattisgarh. There were no funds, no facilities for the villages. He concluded by observing that the human being was not only a material entity, but also had a spiritual existence. In his expert comments, the Chief Editor of Radiance Views Weekly, Dr. Ejaz Ahmad Alam opined that man had two facets - one was material while the other was spiritual. Material pleasure could not give complete gratification. While man was not only a material entity, his quest for possessiveness was limited. Since nature had unlimited systematic universe, the spiritual factor invested life of a man with purity and purposefulness. In his presidential remarks, the Secretary-General of the IOS, Prof. ZM Khan, expressed surprise that Mr. Som Dev would be so thoughtful and hoped that he would definitely reach a conclusion. Civilisation and other issues had raised similar questions. Creation was not accidental and the human being was key to it because man was the supreme creature that God had created, he said adding that various isms and philosophies had sought to know answers to these questions and their answers could not be rejected outright. He stressed that instead of research, search for the answers to this tangle must be undertaken. But the answer to these questions had already been given by the creator of the universe Himself, the said. The function formally opened with the recitation of a verse from the Holy Quran by Hafiz Athar Husain Nadwi. 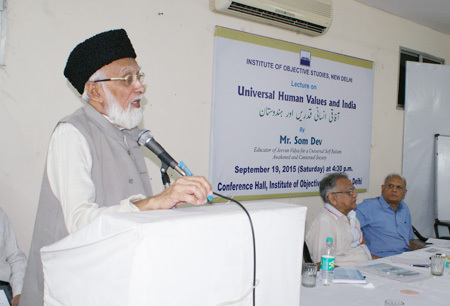 Eminent Arabic scholar, Dr. Nakhat Husain Nadwi presented a brief profile of IOS. He also conducted the proceedings of the function. Advocate, Supreme Court of India, Mr. Balraj S Malik proposed a vote of thanks. 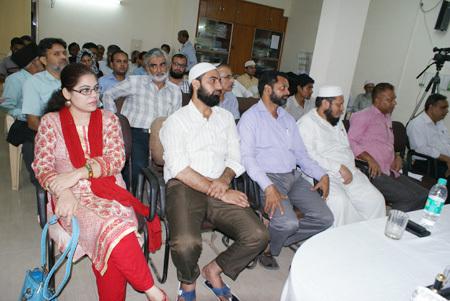 The function was attended by the Vice-Chairman of the IOS, Prof. Refaqat Ali Khan, Syed Ashraf Rizvi, AW Qasim, Syed Ausaf Ali, Kulpreet Kaur, Safdar Ali, Mohammad Noor Deshmukh, Asif Anas, Asrar Jamai, Safi Akhtar, Dr. Bismil Arfi, Faiz Alam, Engineer Suhail Khan, Shaheen Akhtar, Wasim Ahmad, besides several social activists and prominent citizens.